Kuala Lumpur : Pasta Cravings solved at Italiannies, Paradigm Mall. I needed some pasta. Needed some clams. This is the perfect match at Italiannies, Paradigm Mall. Dining at Italiannies, you are always given bread with Olive Oil and Vinegar. This is your pre-appetizer. It does help if you are feeling a bit hungry while you wait for your dish to be prepared. Plain water is also provided free. 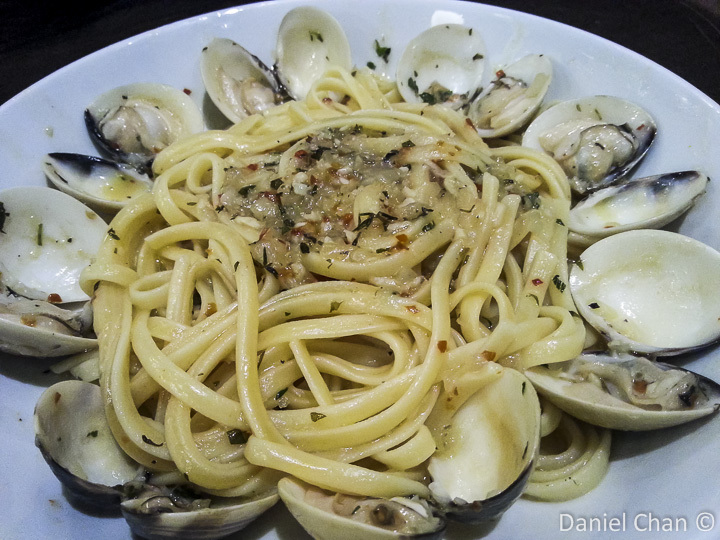 The all week promo of Paste and Appetizer for RM25.90++ was ongoing and I decided to order Clams Linguine. My appetizer was minestrone soup. Bread with olive oil and vinegar. The main course did take some time to arrive. There was a large table at the back and many staff were busy waiting on that table. The minestrone soup arrived. It was quite bland and if you need a kick, you can add your salt. I like this arrangement. Some places assume you want things saltier, sweeter and you end up unable to control the flavor on your own. I prefer bland and add my own salt. Minestrone soup. Some peppers, carrots, potatoes and tomatoes. The quantity wasn’t too bad. I counted about 8 clams, mixed the pasta and sprinkled some salt before chowing down. The mixture of olive oil and fresh garlic made this dish one of my favorite thru the years. The garlic was not overpowering and mixed well with the clams and linguine. What a nice meal. Time for some dessert.